Now through the end of April, ask your driver for a ticket to enter the drawing for a Mountain Bike, Helmet, and Lock! Drawing on May 1st! Posted by Greg Oliver "The Journal"
CLEMSON — Clemson Area Transit has moved one step closer to reaching its goal of replacing its remaining diesel fleet with electric buses by 2023. CAT general manager Keith Moody said the city’s first of 10 newly designed electric buses arrived at the organization’s West Lane headquarters late last week. The Clemson Area Transit system (CATbus) sought a new and fresh look at its routes, fleet deployment, service delivery options, and future capital needs with the goal of increasing ridership and operational efficiency. 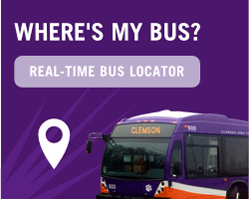 The CATbus service area includes Clemson University, the City of Clemson, the City of Seneca, and the Towns of Central and Pendleton (see Figure ES.1). CATbus provides fare-free fixed-route bus service in and around Clemson, SC for up to 20 hours a day, seven days a week, an unusually long service span for a small bus system. Amtrak train service at Clemson, SC will be temporarily suspended while the South Carolina Department of Transportation completes a construction project to widen Highway 133.